and masks. 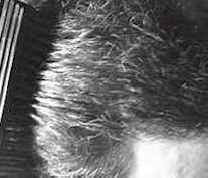 It has a natural look, also on the scalp. It is similar to Couvre Alopecia Masking Lotion, but it is in a spherical container, entirely similar to a female makeup and it has 40 grams product. Water-proof scalp make-up, non-greasy camouflage. Makes hair appear full, thick and natural. Excellent for covering thin spots; hair transplants and alopecia areata. Looks better, DermMatch formula is rich in emollients and botanicals that thicken thin hairs and make them stand up for maximum fullness (shown at right). It leaves your hair thick, smooth and brushable. Sprays, sprinkles and lotions will never look this good on you. For over a decade, doctors have trusted DermMatch for their male and female patients with hair loss. Applies Neater, DermMatch application is quick, clean and precise. Only DermMatch gives you the the EZ Grip, EZ Reach applicators.They make it easy to reach any area, especially around back. If you're thin up front, use them to fade your color gradually and get a perfect, natural hairline every time. Applying sprays, sprinkles and lotions is messy and clumsy by comparison. Stay on better, DermMatch stays on through wind, rain, swimming, sweating and brushing. Botanical and other naturally-derived ingredients give DermMatch it's water-resistant qualities. These ingredients are not found in sprays, sprinkles or lotions and as a result, they can run and drip on you or even fall out when you bend over. Costs less to use, One DermMatch disc lasts 8 months on average. Sprays, sprinkles and lotions don't last nearly as long. You'll save lots of money switching to DermMatch. 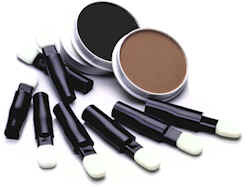 DermMatch is available in the colors black, brown dark, brown, brown clear/sandy, red and grey silver. The change of color is free if you have not satisfied. The product sticks to the natural fats produced by the skin. It withstands the rain, to the wind, to the sweat, to the swimming, to vigorous brushes, while it can have been removing with a shampoo. Every wrapping has provided of four brishes for apply the product (similar to those of the female make-ups). The ingredients are 100% FDA approved at 100% : Talc, Kaolin, Magnesium Myristate, Quatemium-18 Bentonite, Bismuth Oxychloride, Isopropylmyristate, Octyldodecanol, Glyceryl Stearate, Cetearyl Alcohol, Sodium/Stearyl Sulfate, Cetyl Lactate, Isopropyl-Lanolate, TEA-Stearate, Water, Glycol, PEG-6-32, Ammonium Acrylic/Acrylates Copolymer, Methylparabene, Imidazolldinyl Urea, Chlorisothlazolinone, Methylisothiazolinone, Benzyl Alcohol, Triclosan, Fragrance and may contain Titanium Dioxide, Iron Oxides, DC-Red 36 Lake, DC-Red 7 Calcium Lake, DC-yellow 5 Aluminum Lake, Ultramarine Blue. Dampen the applicator and rub the extremity in the container. Then rub the applicator on the scalp, wherever it is necessary. Repeat the procedure. Rinse the applicator and put it to dry. Brush hair to distribute the product. A phon can be used to get a very fast drying. After the drying you can tidy up better hair with a brush. Brush for eliminating every residual. Don't stain the garments. The product disguises a lot of good the scalp and improves in evident way all the miniaturized hair and it can annul completely the bald aspect. Rub DermMatch directly on your scalp to color areas exposed by hair loss or hair transplants. DermMatch applies with precision. Brush it through to coat thin hairs for maximum fullness. No colored clouds from spray cans, gooey mess from tubes or wild particles from sprinkle jars. You can swim with it if you want to. DermMatch survives wind, rain, sweat, brushing and swimming. Other hair loss products can run, drip or fall out. You can wear DermMatch every day for pennies. One disc lasts, on average, 8 months. Who can use it? Anyone with intermediate hair loss. 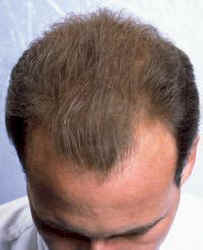 This is where the scalp shows through in small bald areas or areas of thin hair. This includes men, women and children of any race, hair color, hair type or hair style. It also includes persons with hair transplants, alopecia areata, female pattern baldness, male pattern baldness, chemo patients, thyroid patients and anyone with intermediate hair loss. What's the difference between DermMatch and all those colored spray, sprinkle and lotion products? DermMatch adds more lift and fullness to your hair, it looks much more natural, it can be faded at the hairline, it applies much neater, it stays on better (you can swim with it) and the concentrated formula lasts so long it'll even cost you less to use. Is there a money-back guarantee? Yes. 30 days. How long have you been in business? Since 1995. Why do doctors use it? Doctors were the first to use DermMatch over a decade ago. 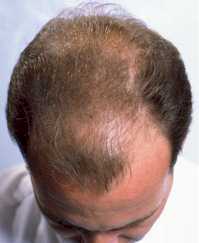 Dermatologists and hair restoration surgeons use it on patients to increase apparent hair density. It's also used to cover temporary post-operative scarring from hair transplant surgery. Doctors trust DermMatch for its healthy, safe ingredients. Will this affect my hair loss? No. DermMatch does not grow hair nor does it impede the growth of hair. Both hair loss and hair growth are subdermal, occurring beneath the skin's surface. DermMatch is topical, resting on the skin's surface where it has no interaction with the biology of hair growth. Does this block follicles? No. Don't get scammed. Read about the "blocked follicle" scam and what the FDA has to say about this. Are the ingredients safe? Yes. In fact, the primary ingredients in DermMatch are emollients. Emollients are the main ingredient in most skin moisturizing products. DermMatch also contains botanical and other naturally derived ingredients. The FDA required ingredient list is shown in order of predominance both on the product label and the brochure. How do I pick my color? We have 8 blendable shades and excellent advice for picking your color. How do I get my free 2nd color? Call us or email us. We will send you any color other than your purchased color. One per customer please. We offer this to help you get your color right. Keep your original color so you can blend the two. How do I get more free applicators? Just ask. Call us or email us. We'll send them right out. What is it exactly? DermMatch is a cosmetic. It's a hard-packed powdered formula that's safe and healthful for your skin. How does it work? DermMatch coats thin hairs, thickens them and helps them to stand up and spread out for spectacular fullness. It also colors your skin to match your hair color, causing the scalp to disappear. It's the only product you can fade for a perfect, natural hairline. DermMatch conditions your hair and moisturizes your skin. You can even brush your hair and swim with it. How do I remove it? Any shampoo removes it. Lather, rinse, repeat. Can women use DermMatch? Yes. About 25% of DermMatch customers are female. Can I use it with transplants? Yes. You can safely use it anytime after the scab phase following surgery. Always consult your surgeon before using DermMatch following hair transplant surgery. Can I use it with Rogaine or Propecia? Yes, you can use it with either one. Rogaine should always be applied before applying DermMatch. Your Rogaine application must be sufficiently dried before applying DermMatch. Propecia is taken orally and with it there are no such considerations. Can I use it with styling products? Yes, but try DermMatch by itself first. It has hair holding properties you may enjoy. If you still need gels, mousse, sprays or other styling products, you can apply them after applying DermMatch. Can I swim and sweat with it? Yes. This includes salt water and chlorinated water. Showering can cause DermMatch to fade so you may need a touch-up afterwards. Can I use DermMatch to color my roots? Yes, it's perfect for keeping your roots colored if you dye your hair. Pick the DermMatch color that's closest to your hair dye.